If B2B sales are important to your business, a professional presentation folder should be a weapon in your literature arsenal. Not only do we design attractive folders, logos, literature and ads, we also make sure that they are aligned with your target audience and your objectives so that they get results. Logo Design – Make a mark with your company’s brand identity. 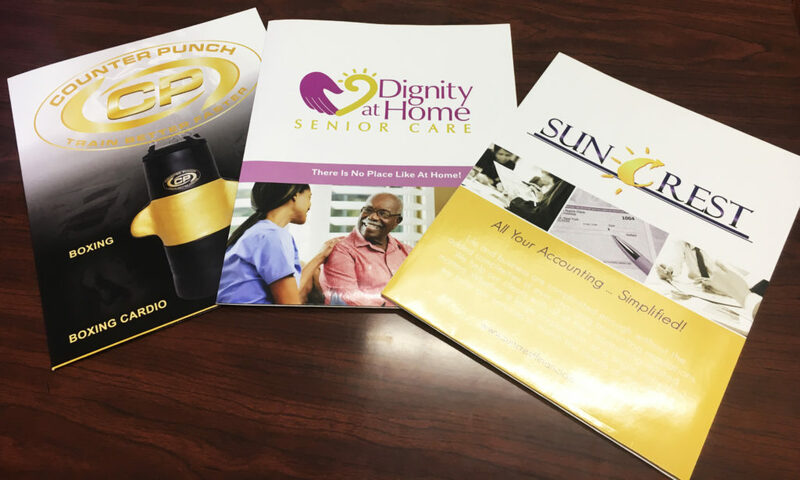 Presentation Folders – Take your company to another level with your own customized kit folder. Book Covers – Draw attention to your book with an exciting, attractive cover. Sales Materials – Whether it’s for an email campaign or a face-to-face conference, we make you shine. Newspaper / Print Ads – Get better results from your ads with our excellent design team. Financial Reports – Put your best foot forward with stunning graphs, charts and tables. Beautiful Flyers / Brochures – Represent your service when you’re not there to defend yourself. Outdoor Advertising – Make your message bigger than life with billboards, bus shelters and outdoor ads. Fleet Signage – Turn your company fleet into traveling billboards. Window Signage – Capture automobile and foot traffic with attractive window designs. We design it and install it! Stationery – Represent your company’s identity in your envelopes, business cards, letterhead, etc. Post Cards – Mail or handout your message in colorful, concise 6″ x 4″ postcards. Retractable Banners – Standout at trade shows or book signings with a portable professional banner. Tradeshow Display – Put your company’s best foot forward with an attractive display for your booth. Posters – Use colorful posters to attract buyers to your product a various locations and functions. Internet Banners – Get attractive banners that are sure to drive qualified traffic to your website. Product Labels – Make your product jump off the shelves with an eye-catching label. If you are ready to step it up a notch, schedule a free consultation to discuss your graphic design needs!